My heart is full……in all the broken places by all the love and support shown this past weekend. 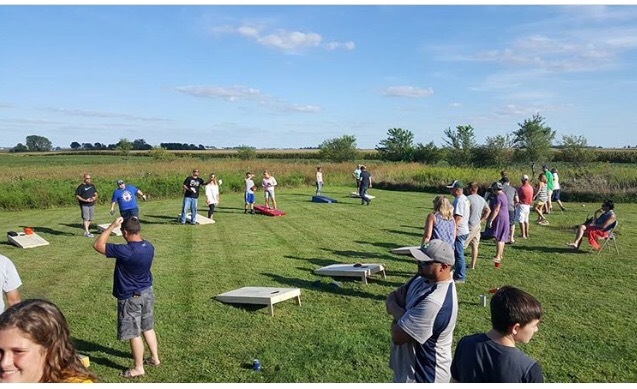 The 1st Annual Team Zayla bags tournament was a HUGE success…..thanks to ALL the friends and family who donated time, money and most importantly HOPE, into us pushing forward with our Memorial events for Zay. We were so incredibly pleased with the amount of people who came out Saturday. Thank you for letting our daughter live on in all the hearts of you….. There were 64 individuals that played Saturday…..and there was over $1000 donated by others who came, but did not play. We raised $2700!!!! That is amazing. A portion of the raised money will go toward Zayla’s culinary scholarship fund. Another portion will go to childhood cancer research (we love St Baldrick’s….they recently donated $500,000 to University of Chicago Comer’s for secondary cancer research in children…..it was like it was meant for Zay!!! Because cancer treatment shouldn’t give you another damn cancer!! ) And a third portion of our fundraising efforts this weekend will go to local families in the form of gas cards, parking stickers, grocery cards, etc….. Because we KNOW how helpful these items are to families faced with childhood cancer. The balloon release (thanks Julie and all the kids) was an added bonus that I had to stand back and quietly absorb. I often forget that others are hurting by the loss of Zayla…..probably because I am so consumed by my own grief…..but it was nice to see the kids be able to express their feelings. 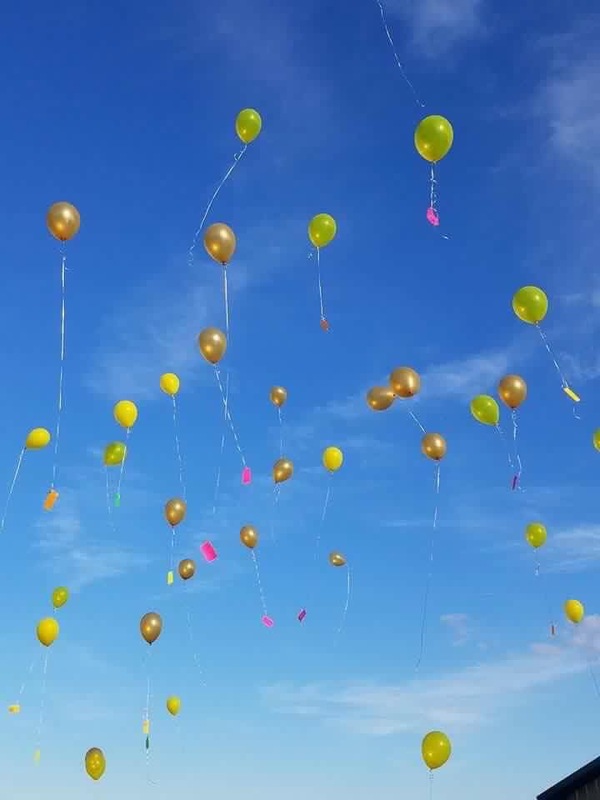 Each kid wrote on a card to Zay, then tied it to the balloon to send to her. Such a loving gesture. These fine teenagers spent the day chasing and entertaining the numerous younger children that were here with their parents….. Our community is amazing….and there really are some GREAT young people in it. I believe we focus too much on all the “bad things” that happens in our world. I am so grateful to get a glimpse of all the good that happens. Like I said….my broken heart is getting filled with the love shown from others. Two classmates of Zayla’s, Grant Wenzelmen and Nic Rink, participated in the bag tournament Saturday. Now these boys were really good!! So good that they WON the tournament. Thing is…..there goodness wasn’t just on how well they played. 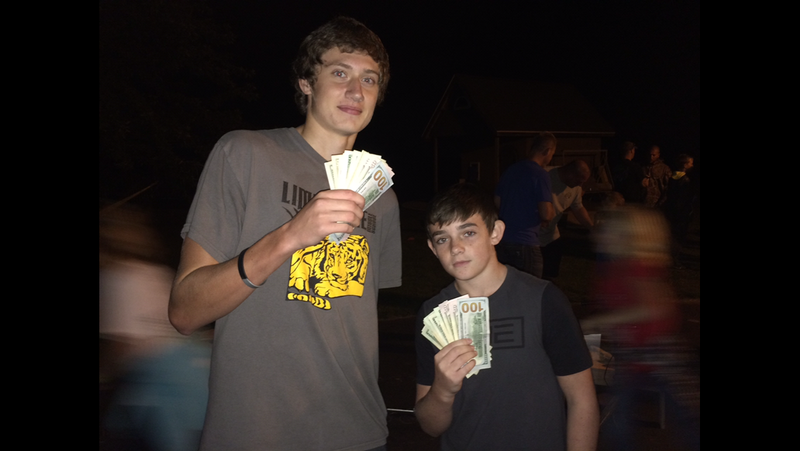 The first place prize money ended up being $750…..these amazing young men didn’t think twice and refused the prize money. Thank you to all who came out, played, donated, and/or thought of us from afar…..we even had donations out of state mailed to us….thank you!!!!! Next event will be in March…..the 3rd Annual Poker Tournament. Stay tuned!! As for us?? It was bittersweet yesterday……we didn’t attend the annual parade in Herscher. First time in over 15 years. 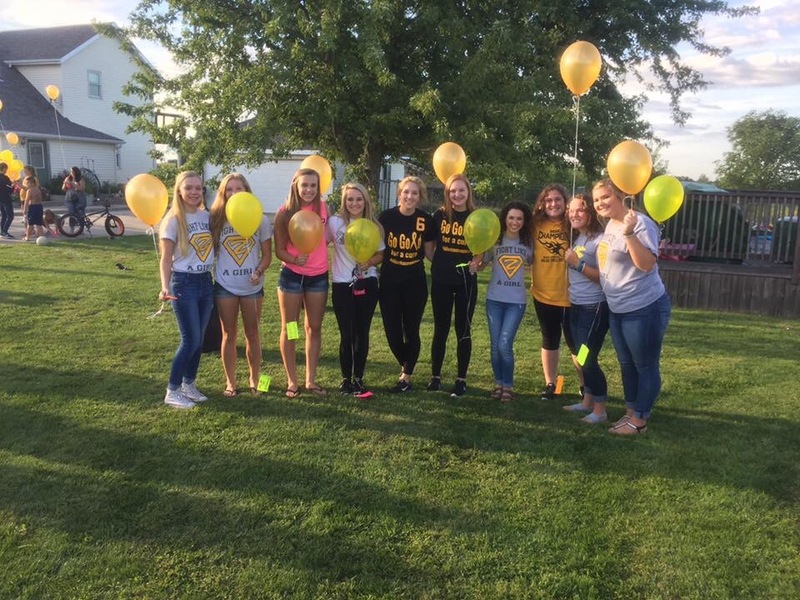 It was always Zayla’s favorite thing…..she especially enjoyed it when we would do a float for Childhood Cancer. We just didn’t have the heart to do it this year…..maybe next year. Not attending the parade yesterday reminded me of a story. Zayla was just released from the hospital for her bone marrow transplant (circa 2007)….she was only 6 years old and had been inpatient for over 2 months. She should have been attending 1st grade, but she was not allowed to go in public due to her recent transplant. So instead, we went to the parade and watched in our SUV. Here is this pudgy steroid faced bald little girl trying to watch a parade in the sweltering heat…..that’s just how she rolled. Nothing would stop her. And although she couldn’t participate in the Princess float…..or sit with the crowd to collect candy with all the other kids…..she made the best of it by watching through the windshield of the car. And all with a smile on her face. Need to live more like Zayla…. I’m sure you had the best seat to watch the parade yesterday…..